So, I am getting a Precision Power BK1800.1 D.
The subs I am getting are rated at 300 rms. Getting 3 subs. Need to decide if I am going to get dual 4 ohm (would be wired to 2.67 ohm) or single 4 ohm (wired to 1.34 ohm). Rms of the amp is 700 @ 4 ohm, 1100 @ 2 ohm, and 1800 @ 1 ohm. I need around 900 rms. Does anybody know "about" what the rms of this amp would be at 2.67 ohm load ? Which subs are you getting? Honestly, I can't seem to find how much power that amp really puts out. Kinda what I was thinking too.......thanks very much for the help. Will get the single 4's. Why are you getting 3? Just for curiosity purposes? What kind of airspace are you planning on feeding these subs? Power can only be determined once you figure out if you're gonna run a LOT of airspace(in which case lower power can be fed to the subs) or minimal airspace where you'll need to send more power. I'm curious on why you'd want two if them, if you have the space available to do 2 15s instead(where I'd get dual 4s). If the 3 12s is where your heart is set, get the single 4s. They would still work in other applications since they aren't big power handling subs in the first place. If you got the single '4s and only chose to run 2 in any future build, you're running at 2 ohms which is perfectly fine and most amps will feed them enough power to do their job. 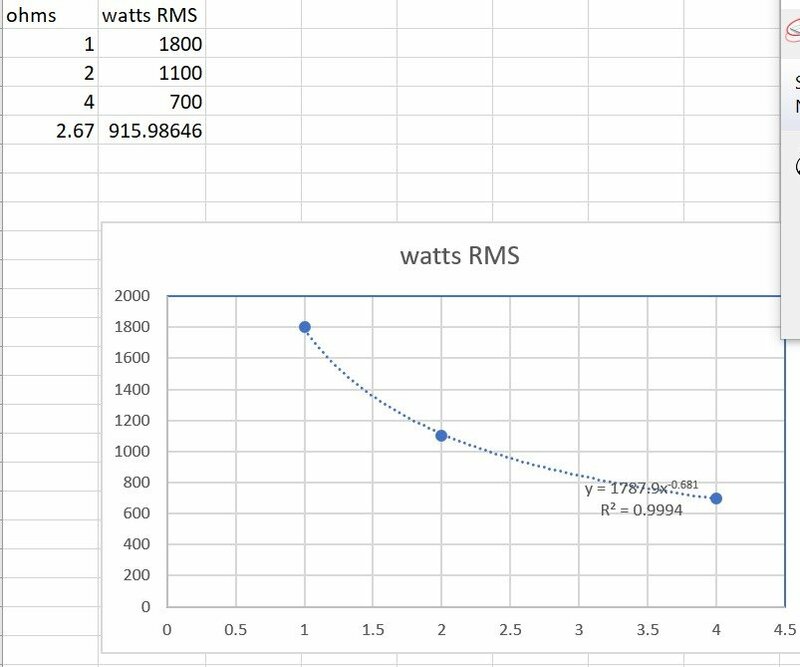 To really answer your question, power at 2.67 ohms would probably be around 800-900 before impedance rise. Im not the one you want to try to troll. Just a fyi for you. I agree, don't give much power to subs in a T-line. What kind of vehicle do you have where you have enough room to get 3 12s in a T-line?